The team poses after their victory over Kellenberg Memorial. On Monday, February 13, Chaminade’s varsity bowling team, led by coach Mr. Terrence Fitzgibbon ’00, captured the CHSAA league championship title. After an extraordinary undefeated 11-0-1 record in the regular season, the team had high hopes heading into playoffs, and they did not disappoint. 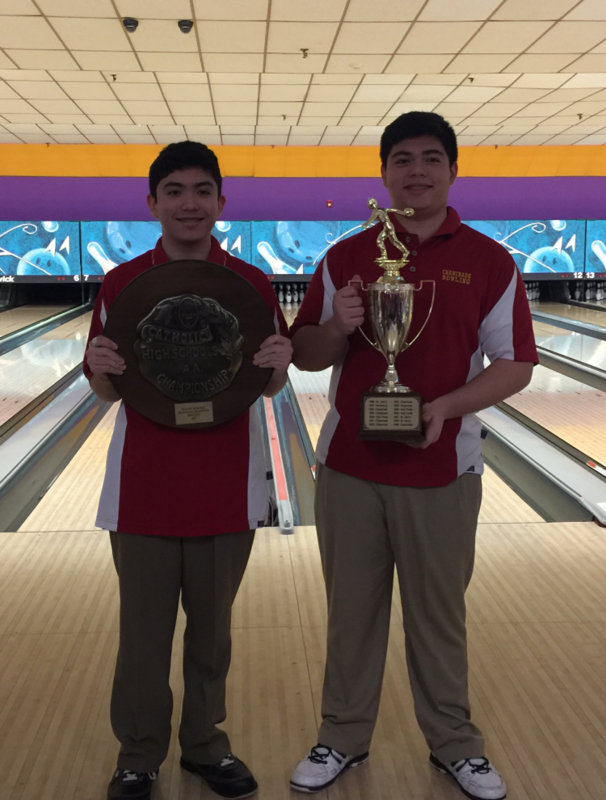 Marcus Alaimo ‘20 (left) and James Alaimo ‘18 (right) pose with the team’s trophy and plaque. Driven by the outstanding performances of James Alaimo ’18 and David Biancos ’17, the Flyers asserted their dominance in an 8-1 semi-final victory against St. John Baptists. Alaimo, who averaged 215 pins per game over the course of the six game playoffs said, “The team worked hard throughout the season. Although there were some humbling moments, the team picked each other up in the end.” Coach Mr. Fitzgibbon ’00 echoed this sentiment, saying, “All season long this team fed off each other and made each other better.” This strong sense of camaraderie only strengthened as the season went on. In the league finals, Chaminade faced off against a familiar foe, the Firebirds of Kellenberg, who tainted the Flyers’ perfect regular season record in a match which saw an unusual 3,093-3,093 pin tie. The Flyers approached this game with something to prove. They wanted to show the world that the tie was merely a fluke, and that they were truly as good as advertised. Chaminade started the match up 2-0, and went into the third game up 3-1. Mr. Fitzgibbon commented, “It was uncanny how this was the exact same score as the previous match, with an almost identical pin advantage.” The team propelled forward through the third game, leaving no doubt who the champions ought to be. David Biancos and James Alaimo bowled scores of 673 and 675 pins respectively in the championship match. The Flyers emerged triumphant over Kellenberg in the championship match, championing the CHSAA league title trophy for the sixth consecutive year. They managed to avenge the tie in convincing fashion and, in the process, continued their astounding reign on the CHSAA mountaintop. Congratulations to the team on an outstanding season!